This swiveling Universal TV stand creates a modern look for your audio video equipment. Works great as a replacement TV stand, Samsung TV stand, Vizio TV stand, Sony TV stand and many others. The black piano finish adds a sleek look that shouts look at me! All while making the most of functionality. The black 8mm thick tempered safety glass base enhances the look and overall design. - Fits TV's from 32 up to 60" in size, even fits many 32,42,55 and 60 inch TV's. Double check VESA pattern to insure fit. - Fits TV's with a VESA pattern between 100x100mm up to 600x400mm. - Measures 24 inches high (not including TV) with the base measurement of 21.5"(w) x 13" (d). - This stand can hold a maximum of an 80 pound TV. Universal TV stand for many applications. Affordable replacement TV stand for most makes and models, easily works as a Samsung TV stand, Vizio TV stand, Panasonic TV stand, Sony TV stand, and many more. This TV swiveling TV stand creates a modern look for your audio video equipment. The black piano finish adds a sleek look that shouts look at me! All while making the most of functionality. The black 8mm thick tempered safety glass base enhances the look and overall design. Smart Design! 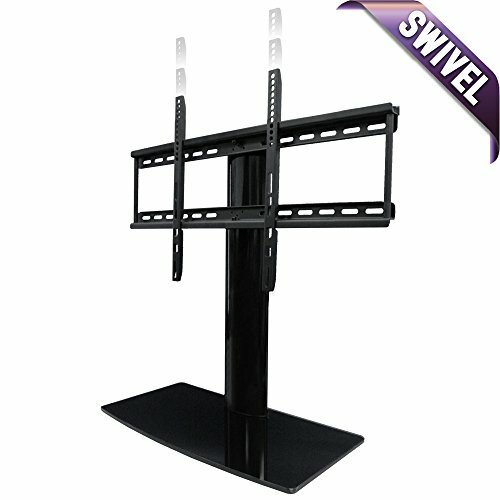 - This TV stand adds a unique ability to swivel where others cannot. Now your TV can be directed up to 45 degrees in each direction towards the viewing area by pivoting the unit. No need to twist the base with it. This feature is usually available only on articulating TV mounts. Form and Function! -This TV stand mounts the TV high enough to have a Sound Bar or video game sensor in front and not block the view or the infrared sensor on the TV. Most TV stands have the TV too low to do this. How it measures up! - This TV mount measures 24 inches tall from bottom to top of column which is not including TV height. The base is 21.5" wide and 13" deep. Maximum TV weight is 80 pounds. This unit weighs in at just 18 pounds. DOES IT FIT MY TV? : This TV Stand will fit most TVs from 32 to 60 inches in size and weighing up to 80 pounds. This mount will also fit many 32, 42, 55 and even some 60 inch TV's. To make sure this mount will fit insure your TV's VESA bolt pattern falls between these two sizes : 100(w)mm x 100(h)mm up to 600(w)mm x 400(h)mm. If your TV's VESA pattern falls between these two sizes then it will fit your TV. If you need further help, please contact AV Express.